Play Lucky Links Slot Online with 500 Free Spins! Lucky Links is a reels, 20 paylines Online Slot Game by Just For The Win. Lucky Links has Free Spins, Respins, Stack, Bonus Game and Wild features and an RTP of 96.2%. The lucky links slot machine is one of the most exciting online slots in the online casino industry and will certainly interest you if you want a fresh experience that can still fetch you some rewards. This collaborative effort between Just For The Win and Microgaming is simply a perfect combination of interesting features and clever gameplay. No wonder the Rose Slot casino game has already appealed to many lovers of female casino online slots. Just For The Win is a reputable casino game provider in the online casino industry. It strives to provide worldwide slot lovers with the most advanced slot games and fun gaming experience for its fans. and it is no surprise that the effort is so clever. They launched this game in November 2017 and has received decent praise of the work. At Rose Slots we also present other popular games designed by the same developer such as Deco Diamonds online slot and Amazing Aztecs slot game. 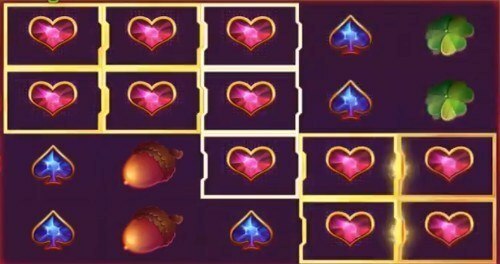 Lucky link slot game has a win-both-ways feature which means your win can form from left to right or right to left, starting from reel 1 or 5. There is a lucky links logo and it pays out the most with a ratio of either 1, 2, or 7.5 times your stake if you are lucky to land 3, 4, or 5 on an active payline. There is no autoplay feature, however. Though there is no bonus symbol, the lucky links are itself a bonus feature. The gameplay of this online casino UK game revolves around it to accumulate your winning. As you spin, one randomly chosen symbol will be framed in gold. If this gold-framed symbol lines up horizontally next to each other on the reels, they will lock in place and you will be rewarded with a free spin. If more land in place, the process will be extended until there are no more lands. It is at this point that your win will be calculated. Lucky Links has 5 reels and 4 rows with 20 fixed paylines. You need the basic understanding of the symbols of the game in order to understand how to win. There are 5 high-value symbols that you can play for. They include the game’s logo, a triple red seven, a silver horseshoe, an acorn, and the four-leaf clover popular among Irish-themed slots. The amazing slots online win real money game is mobile optimized. You do not need to download before you play. It has a faintly Irish theme in a multi-coloured background. As you play on, an electronic soundtrack calms your nerves as you hope for your winnings to accumulate.